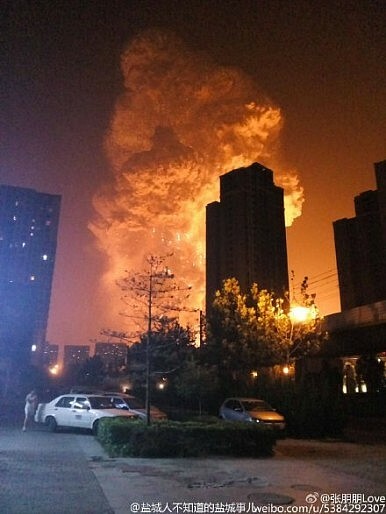 The Paper reports that residential areas were even closer than Caixin’s estimate — within 600 meters of the warehouse. And the damage, Caixin notes, was extensive even outside the recommended 1,000 meter safety zone. In addition, it seems most people were unaware that there were hazardous materials in the warehouse. China’s Global Times talked to local residents who said they had no idea dangerous chemicals were being stored less than a kilometer away from their homes. Global Times and other media reports also suggest even Ruihai employees had not been trained in handling hazardous materials. As The Paper points out, it’s also unclear if the firefighters sent to the area were even told that there were dangerous chemicals on site – that this was “not an ordinary fire,” as The Paper put it. Of the 56 confirmed dead in the explosion and ensuing fires, 21 were firefighters. The Tianjin incident is sparking a widespread discussion of how effective China’s government (particularly at the local level) has been in enforcing safety and environmental regulations. One expert cited by Global Times questioned Tianjin’s overall development strategy, saying the chemical industrial sector had expanded too rapidly and without proper planning. The Paper points out that Ruihai’s warehouse was in violation of the required safety zone for storing hazardous goods before it was even built – so why, then, did the plan sail through the local government’s environmental assessment? As China-watcher Bill Bishop pointed out on Twitter, there have been “several cases [and] much media in recent months” regarding “corruption in environmental impact assessment process.” There’s no reason to believe similar factors not were at play in Tianjin, Bishop says. Ruihai’s manager has been detained for questioning, according to Chinese state media. [L]ack of safety awareness among businesses and lax implementation of safety regulations… inadequate safety management of dangerous materials at ports, irregular practices among workers, weak emergency responses to incidents and lax supervision by authorities. The State Council has found 123 people responsible for the August disaster in Tianjin.